It’s the same thing every year. Apple, Google, and Samsung launch their flagship phones, and people go wild over the cameras. Soon enough, we hear someone saying the death of the DSLR camera is near. But are these smartphones really catching up to DSLRs? What makes a DSLR better? It takes only one look at a comparison in output DSLRs vs. Smartphone Cameras: How Do They Compare? DSLRs vs. Smartphone Cameras: How Do They Compare? Everyone has a camera in their pocket, so is it worth getting a DSLR? We look at the pros and cons of each to help you make a decision. Read More to know that phones aren’t yet good enough. And it makes sense once you find out what are the important specs in any digital camera. The biggest difference between a DSLR camera and a smartphone is the sensor size. And that alone is enough to create that chasm. Till phones have sensors that match those of DSLRs, it’s silly to think the output will be as good. The sensor is the base technology of how a camera works How Does A Digital Camera Work? [Technology Explained] How Does A Digital Camera Work? [Technology Explained] Read More . Its job is to capture all the light coming in through the lens. The larger the size of the sensor, the more light it can capture. The more light a sensor can capture, the more detailed and true your photos look. Want to take a guess at the sensor size of smartphone cameras? 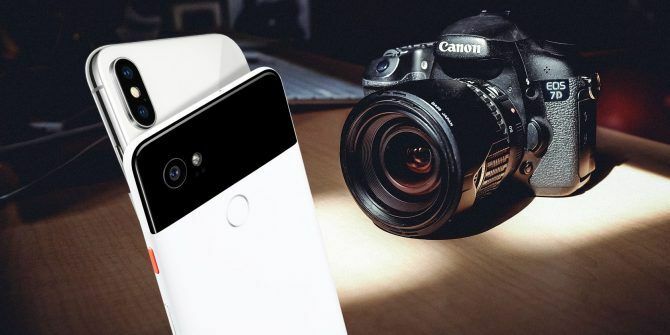 The Google Pixel 2 Google Pixel 2 and Pixel 2 XL: Everything You Need To Know Google Pixel 2 and Pixel 2 XL: Everything You Need To Know The Google Pixel 2 and Pixel 2 XL are here -- so here's everything you need to know about them. Read More , arguably the best smartphone camera today, has a sensor measuring 1/2.6 inches (5.5 x 4.1 mm). So a DSLR’s sensor is anywhere between 4-6 times larger than a smartphone’s sensor. Even if the camera’s sensor size is larger, its megapixel count might not be as high. The Nokia 808 PureView famously had a 41-megapixel camera, but the sensor size was only 1/1.2 inches. But its pictures pale in comparison to the Canon EOS 1300D or Nokia D3400. Both these DSLR cameras have APS-C sensors at only 24 megapixels. So how do they have better pictures even with megapixels? Well, you shouldn’t believe in the myth of megapixels 8 Camera Myths You Should Stop Believing Immediately 8 Camera Myths You Should Stop Believing Immediately Let's clear up some of the strongly held and often completely misleading beliefs when it comes to compact cameras and DSLRs. Read More . Marketers push this statistic because it is a number that can be manipulated easily. The truth is, cramming more megapixels onto a sensor alters the image quality. In fact, less pixels on a larger sensor result in larger pixels, which in turn capture more light. And this means the image processor will reduce noise. The sensor’s job is to capture light and turn all the colors into electronic signals. But the result is something akin to a jigsaw puzzle of different color signals. The image processor is the unsung hero who takes those colors and builds an image out of them. This image processor is the “brain” of the camera. It has to read the light meter, access and understand colors How To Learn Color Theory In Less Than One Hour How To Learn Color Theory In Less Than One Hour Basic knowledge of color theory can mean the difference between an "amateur" aesthetic and a "professional" one – and it really doesn't take long to learn. Read More available in the sensor, check the time of capture, and smartly put together the puzzle. The accuracy of what you see with what photo you get is as much the function of the processor as any other part. This is a tough job for any image processor. And this is why you sometimes see “noise” in photos. “Noise” is a wrongly placed pixel of color in finishing the jigsaw puzzle. The image processor also has more important jobs (like the Bayer transformation for speed) but those are too technical to get into here. Now think about it this way. A DSLR has an image processor whose job is to understand photography and nothing else. It’s a dedicated worker whose entire life is about putting together accurate images. Meanwhile, smartphones also have image processors, but these work along with a whole lot of other circuitry. And they have limited space to work on the limited size of a phone. It’s no surprise that a dedicated DSLR image processor does a better job than smartphones. 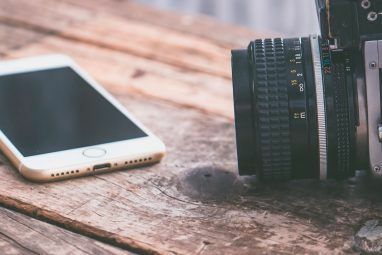 Smartphones have done better with aperture and shutter speed, the basics of a camera 5 Ways to Learn Photography Basics and Improve Camera Skills 5 Ways to Learn Photography Basics and Improve Camera Skills Learning photography is the first step. These websites and tutors will teach you photography basics with interactive demos. Read More . The new lot of iPhones and Pixels manages f/1.8 aperture, which is comparable to mirrorless and DSLR cameras. Apart from lenses though, you can expect smartphones to make rapid progress over the next few years. 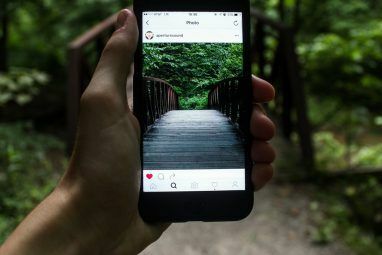 There aren’t major long-term physical restricting the introduction of better camera technology on phones. It will just take time. 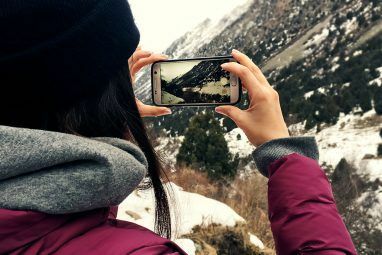 Do You Think Phones Can Replace DSLRs? Today, hobbyists and travelers should buy mirrorless cameras Why Mirrorless Cameras Are Better Than DSLRs for Hobbyists & Travelers Why Mirrorless Cameras Are Better Than DSLRs for Hobbyists & Travelers Whether you're a hobbyist, a keen travel shooter, new to photography, or even a pro, it's time to switch from DSLR to mirrorless. Read More over DSLRs. But the raging topic these days is whether phones will get there soon. Do you think smartphones can ever replace DSLRs? Has your phone already made you forget about your big old camera? Explore more about: DSLR, Photography, Smartphone Photography. A phone camera lens aperture of f1.8 is not comparable to a larger camera lens aperture of f1.8. The number merely denotes the ratio of the largest possible aperture to the focal length. As phone lenses are tiny, with a focal length of under 3mm, the aperture will also be tiny. Less than 2mm for an f1.8 lens. So the depth of field will still be enormous. This is why those that like photos with out-of-focus backgrounds choose a larger camera. The 'f1.8 lens!' on phone cameras is pure marketing to the uninformed. Good article. Btw, some tiny mistakes on 2nd paragraph under Section "Stop Counting Megapixels". I believe you meam Nikon instead of Nokia and Canon EOS 1300d only have 18Megapixels. The length and height of the sensor maybe 4 times smaller... But the area is more like 16 times... 16 times more light! At least. Full frame is more like 36 times more light. Phone cameras have a long way to go. Image quality has improved 100% but when you want to print larger sizes phone quality shots are still very pixilated. Apart from sensor size/performance it is the lens that makes the biggest difference. Yea, I think that was a mistake. Also, most Android tablets come with poor cameras which are low resolution. Of course, you don't buy the tablet for the camera. The camera is mainly used for QR Codes or other scans. The front facing can be used for Skype or other chatting.